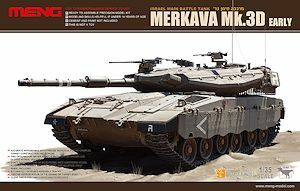 The new kits of the Merkava Mk.IIID from Hobby Boss (kit #82441) and Meng Models (kit #TS-001) both come with individual link plastic track, workable in the HB kit and gluable in the Meng kit and many modellers prefer fully working track with also preferring metal tracks for the weight and duability factors. 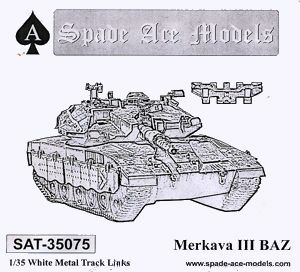 At this time there is only one set of aftermarket tracks with the correct style links for the Merkava IIID, those being this set from Spade Ace Models, Friulmodel have a set of Merkava Mk.III tracks (set ATL-49) but these are for the initial Mk.III and while the links are the same size the Mk.IIID tracks have different pattern link face details. I would assume Friulmodel (and others) may release a set specifically for the Mk.IIID but for now its on with the review of the Spade Ace set. 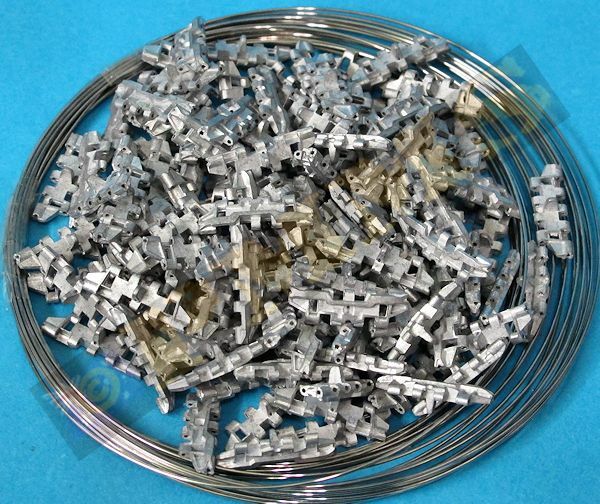 The set consists of approxiametely 240 white metal links and coil of 0.65mm steel wire to cut up for the track pins. The track links are quite cleanly cast with nicely done link details although there isn't any of the fine casting numbers, these are very small and probably hard to see from normal viewing distances. 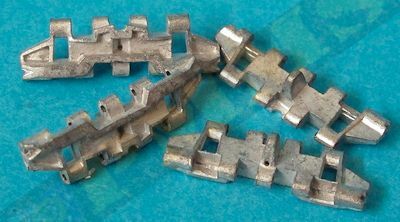 The amount of clean-up varies with some links not requiring any clean-up while on others there is quite a bit of excess metal to be removed with the track pin holes fully hollowed out with no drilling required before assembly. 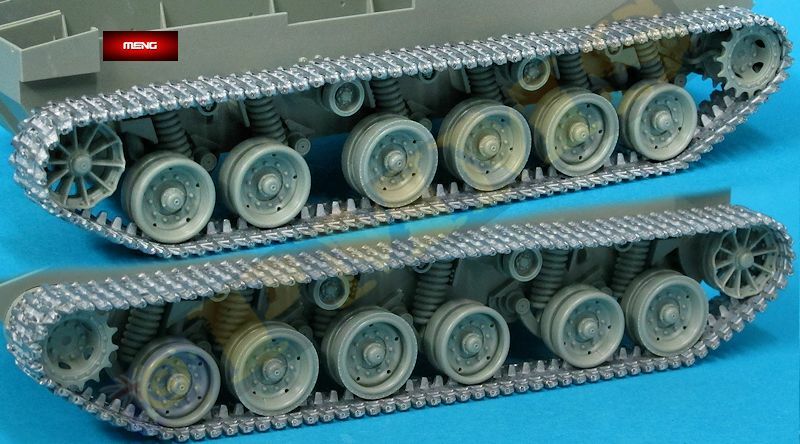 Dimensionally the actual Merkava IIID tracks are 610mm wide which equates to 17.43mm (17.5mm rounded) in 1:35 scale with the Spade Ace tracks measuring 18.7mm wide leaving a difference of 1.2mm. 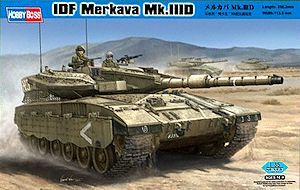 The actual Merkava IIID uses 106 links per track run with this set using 107 links meaning they are fractionally undersized in length but nothing to get excited about. The steel wire included for the track pins is extremely hard steel and cutting to the 18mm pin lengths is very difficult and requires heavy duty clippers or some form of power tool? This doesn't make cutting the pins precisely to the required 18mm an easy task at all, added to this is the need to file the sharp burs created by the clipping process from the ends of the pins to stop them digging into the insides of the link holes and again filing the hard steel a time consuming task. I also tried annealing the wire through a flame but while this made it a little more pliable cutting the wire was till extremely difficult. After encountering the same issue with other Spade Ace sets I saved the hassle of cutting and filing the pins by substituting the hard steel wire provided with softer 0.6mm copper wire, this allowed the pins to be easily cut using a #11 blade to get nice square ends to the pins, you could also use 0.6mm plastic rod that would be even easier to cut. After cleanup of the links and cutting of the 18mm track pins, this can be done using a steel ruler as a cutting board so you cut (using a #11 blade) each pin to the exact 18mm using the ruler calibrations as a measure for the pins length, from here assembly is very straightforward really by fitting one link into the next and inserting the wire pin, occasionally the links may not align exactly and you just need to move them a little until the pin slips into place. After fitting each track pin secure with a dab of thick cyanoacrylate on the end of the pin so it won't come loose at any time while handing the track runs, repeat the sequence for each of the 107 links required for each track run with the assembled track runs being extremely robust and articulate freely. Note; I had previously said the tracks wouldn't fit using 107 links, I must apologize as this must have been a seniors moment as I have re-tested the fit and the tracks indeed fit using 107 links per track run with a nice snug fit around the sprockets and first and last road wheels on both kits without any modifications to the idlers. Again I apologise for the misleading info previously, a bit embarrassed here but this makes these tracks a straight replacement for the kit tracks. The Spade Ace track fitted around the Hobby Boss kit sprocket showing nice snug fit. The Spade Ace track fitted around the Meng kit sprocket showing nice snug fit. 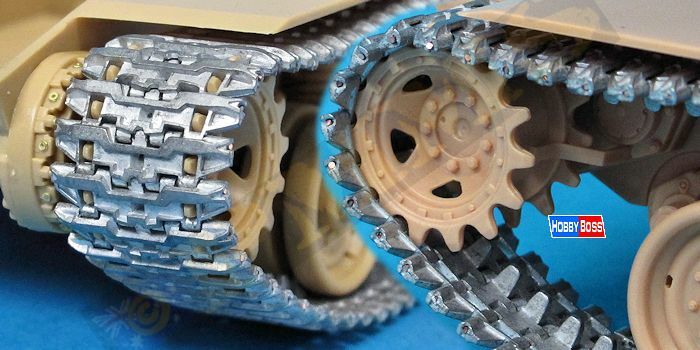 The tracks fitted to the Hobby Boss kit suspension with 107 track links per track run. 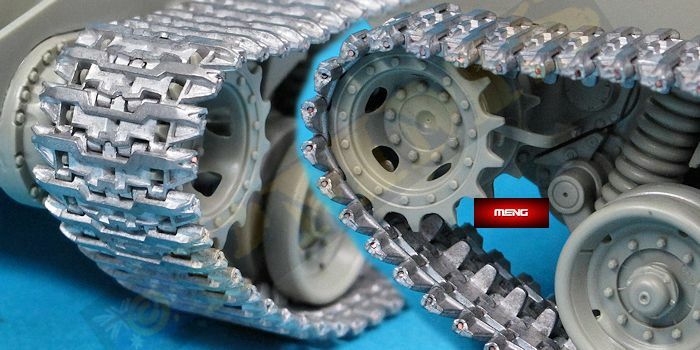 The tracks fitted to the Meng kit suspension with 107 track links per track run. 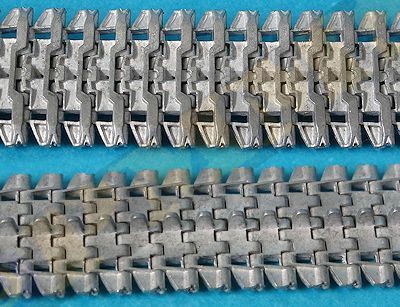 This set of metal tracks from Spade Ace Models is nicely detailed with good track link definition and has only minor cleanup required for the links prior to assembly but the hard steel wire provided for the track pins is extremely difficult to work with and replacing this with softer wire will make life easier. The are slightly too wide by 1.2mm if that is an issue and use 1 extra link per track run but assemble easily and are very robust and overall provide an excellent alternative to the plastic kit tracks. Thanks to my credit card and for the review set.